Copyright, 1893, by S. H. Brown. Words by Charles H. McIntosh. Music by The Gallery God. Have you seen the mother smiling, with a face so good and kind. All within so bright and happy, while the golden sun does shine? And now from this once happy home the bright sunshine has gone. After the sunshine has vanished, evening then turns into night. Some hearts are glad, others are sad, after the sunshine Is gone. Within a grand old mansion a bachelor dwells alone. 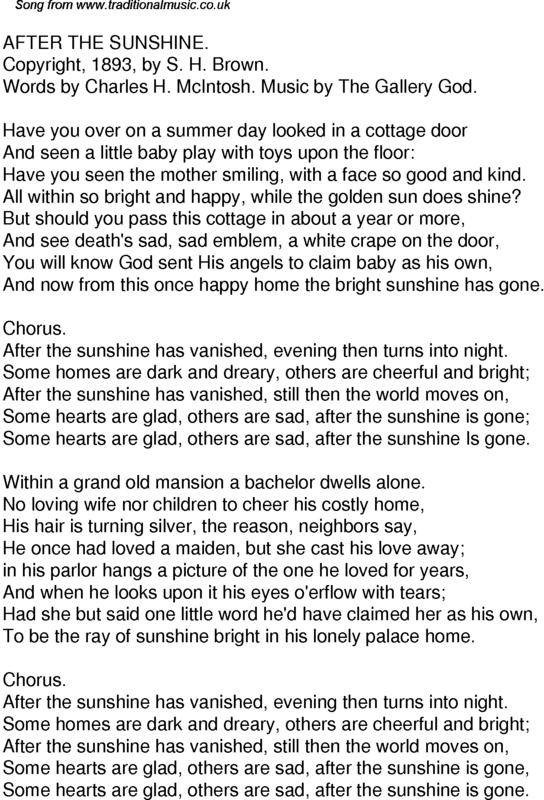 To be the ray of sunshine bright in his lonely palace home.